I have had a lot of fun over the years doing furniture makeovers, trying new paint techniques and giving old furniture an updated look. I love to paint because it allows me to experiment with faux techniques and it allows me to explore truly antique paint colors. I also enjoy the challenge of turning something dated into something beautiful. I make over furniture as a hobby, and I try to focus on classic upscale styles such as Chippendale dressers, French furniture, American styles which I usually make over with paint. French furniture has become my choice of furniture because it has so much potential. 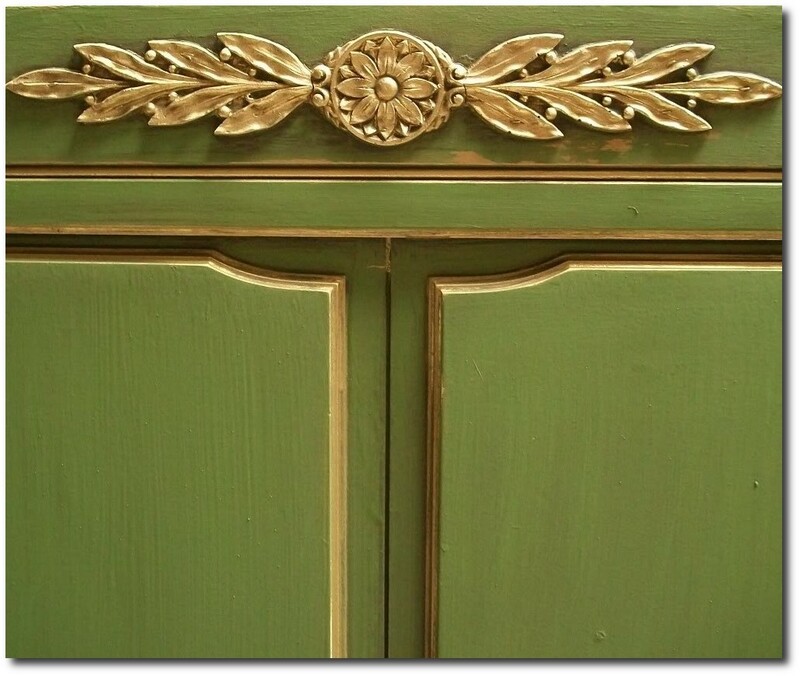 You really cannot paint a classic chippendale dresser yellow or pink, but you can with a French dresser. 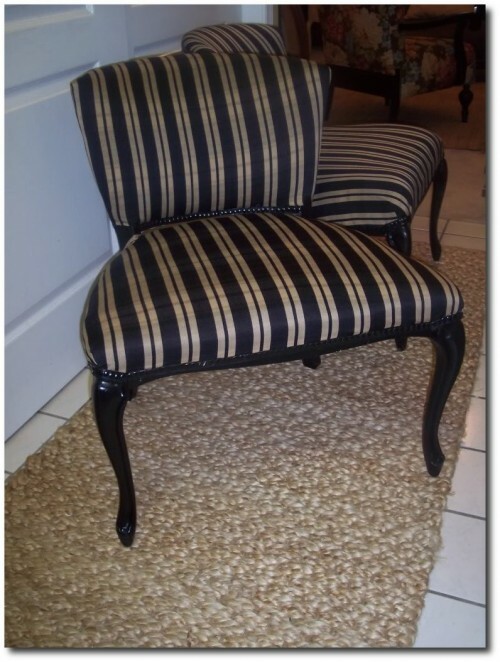 The curvy lines of most French furniture pieces are just brimming potential. 1. Bright Colors and Patterns - Typically either solid colors or dramatic patterns such as the prints Jonathan Adler is famous for. 2. Faux woods and Marbles such as are found in the palace of Versailles, or Tuscan blacks. 3. Antique Swedish looks - High end white finishes. So just how did I start painting? I am Canadian, while my husband is American, so I wasn't able to work full time when I first moved down to Virginia. We went through the extensive immigration process, which meant at first I couldn't work right away after arriving in the United States. It allowed me some time for small projects and makeovers. But it wasn't until the second year of our marriage when our apartment building went through a management change that things really opened up for me. I ended up becoming manager of our apartment building. Actually, I managed two buildings, which allowed me plenty of opportunity to learn how to mix different paints, and do small DYI makeovers. It helped tremendously that the owner of the building was open to DIY changes. He was grateful for any improvement and allowed me great freedom in decorating the buildings. I really took to painting and really took an interest in color theory. I have learned to love faux finishes and the possibilities they hold for creating period looks. After the apartment buildings got sold, we moved on and I started painting furniture. As we were in the process of moving, I needed to get rid of some furniture and I discovered the joy of selling things on craigslist. I found that there were a lot of people out there interested in looking for nice quality furniture. I decided to look for only furniture I loved myself. I focused on colonial and traditional furniture styles which were easy to find in Virginia. I learned that people really loved classic white and black finishes. While some of my girlfriends painted colorful pieces, I learned that only certain types of furniture worked with certain colors. As I got more into painting, our small 2 bedroom condo quickly became overcrowded with all my painted projects laying around. I felt so bad for my husband, but every business has to start off some way or another. We constantly had wet painted furniture all over the condo, and there were times when it drove me kind of batty. I learned how to be a very neat painter, because often times I had carpet I had to keep a meticulous eye on. My husband started blogging, which over the years turned out to be a full-time business. He left his job as an attorney, and we both moved towards making money online. Living in a 2 bedroom condo, with one bedroom holding all of our furniture, I painted furniture while he worked hard on our Internet adventure. Today, we blog full time, and I don't paint furniture anymore for re-sale, but still paint in my free time. I really enjoy trying to master Swedish finishes. They intrigue me, and I am still experimenting with other finishes as well. I am still learning and growing, and I am hardly a master, but continue to learn along the way. You can find more of my home here. Love your blog! Fun, informational, will look forward to more posts! I have a night stand and triple dresser that I’ve had for 32 years in the off white color and want to paint them black. But, I don’t know what to do about the tops since they are formica. Can the formica be redone in black? Or if not, how do I handle it to paint it? My best suggestion is to sand your dresser quite well as the first step. In order for the paint to stick to the top of the dresser, it needs to be sanded well. I would suggest your first coat to be in flat, as it will stick better to the surface than any other sheen. You cannot find a primer in black, and I have tried priming the surface in a gray and it hasn’t worked out well for me. After it is dry, you can paint the entire dresser in Rust-Oleum Black Satin Finish. Many people do not like to work with oil paint, but I prefer it because it is very durable compared to water based paints. I know when I send people home with a painted piece of furniture, it will last longer than water based finishes. When you work with oil paint be sure to buy paint thinner, as oil is hard to clean from your brushes without using some type of solvent. Do wear gloves. If you find you get paint on your skin, try Goof Off to get it off. I tend to get a very nice finish by painting on the oil first with a chip brush that has natural fibers. You can buy chip brushes for $1.25 at any hardware store, and then my secret to nice even finishes are to use foam paint brushes which then even out your paint strokes. Thanks! Would black lacquer paint work on the top to give it the same look and durability as the Formica? I came across your blog and was drooling at all of the beautiful pieces of furniture that you’ve done…outstanding!! I just purchased a french provincial bedroom set for my little girl off of craigslist with the intention of painting it an antique white for her bedroom. I had not ever seen the hardware painted the same color as the wood and it looks FANTASTIC!! Can you tell me how to paint the brass so that it will not come off? Also, would you suggest spray painting the furniture and if so, what brand/type would you recommend. Any help you can give me would be sooo appreciated as I’ve only painted a few pieces of furniture in my day. Yes~ Oil paint or Lacquer paint are both excellent choices to apply over Formica. Lacquer paint is often used on cars so it is extremely durable. I tend to use oil paint on my pieces because it doesn’t chip and holds up much better compared to water based paints. I usually tend to sand the formica before I paint it so that the paint has something to grab on to. Hello, I love what you are doing and what a great blog. Very inspirational! I am new to the furniture refinishing and I am very sensitive to odors and for that reason I would prefer to use latex paint, do you have any you would recommend? I have a few projects on the shelf and would like to have confidence doing them. Also, I am wondering if you ever use primer or if your suggestion is only about when using black paint? I have found the guys at the stores recommend primer highly. However, I would like to hear what you recommend since you are already doing this work and have the tried and true experience. thank you for sharing your knowledge with us! Hello-I have loved looking at all the beautiful furnitures pieces you have done. I have no experience at painting furniture but have a french provincial bedroom suite from the 1970’s that I want to apint for my daughter. Ivory w/the gold trim. I want to paint it an ivory color close to the original. Do you think I will need sand & use a primer? Considering the age of the furniture, it is in excellent condition, smooth surfaces with no deeps scrathces or knicks. Any advice is appreciated! All of this furniture is as heavy as lead! What would be the wood that it is made from? I just LOVE what you have done with your furniture. The chairs are beautiful! Did you have these reupholstered? Your website has inspired me! Thank you!